A cluster headache (CH) is a debilitating headache disorder and has been described as the most painful condition in humans. Given the excruciating nature of the disorder, instituting proper treatment is paramount to improve the quality of life of patients. Unfortunately, many patients are undertreated, and in some cases, not treated. Furthermore, individuals with CH are more likely to use prescription and nonprescription pain medications, including opiates. The chances of drug dependence are also higher among CH sufferers. For these reasons, it is important than clinicians are aware of the different treatment options for CH, the evidence base to support their use and their appropriate implementation in clinical practice. Treatment for CH is involved three different strategies. The first is abortive, which refers to the treatment of an individual attack. Transitional treatment refers to the treatment given at the onset of a cluster period with the intention of decreasing the frequency of attacks. Simultaneous with transitional therapy, preventive treatments are used for the anticipated duration of the cluster period to reduce the frequency, duration, and severity of individual cluster attacks. We will review each of these below. It is important to note that CH is a relatively uncommon disorder, affecting just 0.1% of the population, and there is a paucity of large-scale, controlled clinical trials. Many treatments are based on the lower quality of evidence. Below, we will discuss those agents with the highest quality of evidence, those most commonly used, and those which show promise and are under investigation. A number of agents have been studied with regard to their abortive role in CH. Given the rapid onset of a cluster attack with a very short time to peak intensity (<15 min) and a relatively short duration of each attack (<3 h), many of these agents are parenterally administered. The recommendations from the American Headache Society (AHS) guidelines for use vary from Level A to C. There are also several agents that are sometimes used in clinical practice despite an uncertain level of evidence and no clear guideline recommendation. The oral options for abortive therapy are limited, although Zolmitriptan 5 mg and 10 mg have been shown to be effective at improving headache in one Class I randomized controlled trial. The primary end-point was headache reduction at 30 min and reached significance in the episodic CH group (P = 0.02) but not in the chronic CH  group. Other oral triptans, while sometimes used have not been studied in controlled trials for CH. While other oral triptans are sometimes used for the acute treatment of cluster headache, they have not been evaluated for efficacy in placebo-controlled clinical trials. Oxygen is an established effective acute treatment option for CH. Oxygen (100%) delivered at a rate of 6–15 L/min by nonrebreather face mask has been shown to improve headache in CH patients. There have been several studies investigating the effectiveness of oxygen in CH. The first double-blinded cross-over study was conducted in 1985 with 11 patients, treated with 6 L/min of oxygen by nonrebreather. In this study, 56% achieved complete or adequate pain relief in 80% of their attacks compared with 7% in the placebo group. A subsequent double-blinded, randomized placebo-controlled cross-over study of 76 patients in 2009 found that 100% oxygen 12 L/min by nonrebreather face mask resulted headache response in 78% of patients compared with 20% for placebo. Other series, unblinded or open-label studies have shown similar results, however, higher flow rates appear to be more effective., More recently, a demand valve has been investigated in an open-label pilot study of four patients using a demand valve with promising results. Given the safety and efficacy of oxygen, all patients with CH or who are suspected to have CH warrant a trial of oxygen. It currently carries a Level A recommendation. The main drawback for oxygen is its lack of portability. It can be cumbersome and inconvenient for those with frequent attacks. Furthermore, valves allowing for higher-flow oxygen which can be needed are not always readily accessible. Compared with zolmitriptan or sumatriptan, however, there is no defined limit to the number of times it can be used in a given day, and thus oxygen is a good choice for those with multiple attacks per day. Both zolmitriptan and sumatriptan are available in intranasal formulations and both have been studied in the abortive treatment of CH. Zolmitriptan, both 5 and 10 mg have been shown to be effective (Level A).,, In a study of 52 patients, headache relief at 30 min was achieved in 50% of patients treated with 5 mg and 63.3% of those treated with 10 mg of zolmitriptan intranasal compared with 30% in the placebo group. Sumatriptan 20 mg is also likely effective in the acute treatment of CH and is a reasonable alternative to zolmitriptan. Sumatriptan intranasal was evaluated in one double-blind placebo-controlled trial of 118 patients showing 30 min responder rates of 57% versus 26% for the placebo group (P = 0.002). The intranasal triptans are probably less effective than the injectable forms (discussed below) and are contraindicated in those patients with cardiovascular disease, stroke, peripheral vascular disease, and severe hypertension. In addition, triptans, intranasal lidocaine have also been evaluated for the acute treatment of CH. The exact dosages and preferred method of administration remain uncertain, but nasal drops, sprays, and application with cotton swabs with concentrations ranging from 4% to 10% have been suggested. The first study demonstrated that about one-third of the patients responded to ipsilateral lidocaine administration, but this was a small cohort and was not randomized or blinded. In a subsequent double-blinded randomized study of 15 CH patients, all patients had a response to lidocaine administered bilaterally. There does not appear to be any significant adverse effects from lidocaine, and despite the absence of a robust evidence base remains a viable option for some patients. While sometimes used in clinical practice, dihydroergotamine (DHE) has not been proven as an effective abortive therapy in CH. It may be worthwhile to attempt a trial of DHE in patients who are refractory to the more conventional treatments. One double-blinded, placebo-controlled trial of DHE in 25 CH patients suggests that intranasal DHE reduced the intensity, but not the duration of a cluster attack. The typical dose for intranasal DHE is 1 mg. Like the triptan medications, DHE is contraindicated in those with coronary artery and cerebrovascular disease. Injection therapies can be an excellent choice for patients with CH as they are rapidly acting. Subcutaneous sumatriptan has been shown in two Class I randomized control trials., One study of 131 CH patients reported headache relief in 75% of patients compared with 35% of placebo at 15 min (P < 0.001). In a study involving 131 patients with CH, 75% treated with subcutaneous sumatriptan reported headache relief at 15 minutes compared to 35% treated with placebo (P< 0.001). An earlier, smaller study yielded nearly identical results. It also found that 13% of patients also required oxygen as an adjunct. Higher doses have been with higher incidence of adverse effects, and in fact, 12 mg was not found to be superior to 6 mg. There are lower doses of sumatriptan injectable available (3 mg) which may also be effective some patients. Those with long duration cluster periods and multiple attacks per day must be aware of the amounts of their overall consumption of the drug due to the risk of medication overuse headache. One randomized, placebo-controlled trial of octreotide 100 μg ended with 46 attacks treated with octreotide and 45 treated with placebo. The 30-min headache response rates were 52% and 36% (P = 0.007), respectively while the 30-min headache free rates were 33% and 13%, respectively (P = 0.04). Overall, the treatment appears to be relatively well tolerated and may be a reasonable second-line alternative for those patients who have failed to respond or have contraindications to triptans. The sphenopalatine ganglion (SPG) has long been a therapeutic target in the treatment of CH. Blockade of the SPG with suprazygomatic alcohol injections relieved pain in 85% of 120 patients (follow-up between 6 months and 4 years), but this procedure has fallen out of favor because of the potential for painful neuritis of the maxillary nerve. Radiofrequency ablation of the SPG has been employed in uncontrolled small case series, with efficacy in 60%–80% of episodic cluster headache (ECH) and 30%–70% of chronic cluster headache (CCH) patients.,,,, While pulsed radiofrequency in 16 refractory patients with ECH and CCH resulted in complete remission within 6 days in 12 patients. In 16 patients with refractory ECH and CCH, pulsed radiofrequency resulted in complete remission in 12/16 patients within 6 days. Using endoscopic technique, 20 patients with refractor CCH were treated with injections of corticosteroid and local anesthetic directed toward the SPG. The improvement was seen in 58% of patients, but the duration of benefit was short making repeated injections less than attractive over time., Using a novel image-guided navigation system, 10 patients with refractory CCH were treated with SPG-directed injections of OnabotulinumtoxinA (25–50 units). An average attack frequency reduction of 77% was seen in 5/10 patients over a 6-month follow-up period. A multicenter, sham-controlled study using an implantable, on-demand SPG microstimulator (Pulsante ®) in medically refractory chronic CH (Pathway CH-1). Of the 28 patients treated, 67.1% of patients had pain relief at 15 min compared with 7.4% of sham-control and 7.3% of subperception-treated attacks (P < 0.0001). In this trial, 36% of patients also experienced a reduction (>50%) in the frequency of attacks. A 24-month open-label follow-up study (n = 33) revealed an acute response in 45% and a frequency reduction in 33. A second multicenter sham-controlled trial (Pathway CH-2) is now underway to further investigate the efficacy and safety of SPG stimulation (NCT02168764). Transitional treatment (or transitional prophylaxis) is employed at the onset of a cluster period to provide rapid cessation or reduction in attack frequency during a short period of time until a long-duration prophylactic agent has its onset of effect. Therefore, transitional and maintenance prophylaxis is often started simultaneously. The options for oral transitional therapy are rather limited and are essentially restricted to corticosteroids. While the optimal amount and duration of steroid treatment for transitional therapy are unknown, prednisone 1 mg/kg or a minimum dose of 40 mg is a commonly employed strategy in clinical practice. One study of 19 CH patients revealed complete pain relief in 11 patients, 50%–99% relief in 3, 25%–49% relief in 3, and no response in 2 patients. Two other studies have yielded similar results. The benefit of oral steroids is that their administration is not depending on an operator or a medical setting and is more convenient for the patient. A tapering schedule over 1–3 weeks is a reasonable approach, but some studies have observed a taper period of as many as 30 days, which for some patients may be excessive. Oral triptans have been reported to be a potential option for transitional treatment in CH, but have been inadequately studied. While recent retrospective reviews have shown a possible benefit of Naratriptan, studies on frovatriptan BID  and sumatriptan TID  have been disappointing and are not currently recommended as first- or second-line therapy. Further studies are required to determine whether certain patients be candidates for short-term triptan prophylaxis. Treatment with parenteral corticosteroids may also be of benefit for some patients. Administering a single dose of 30 mg/kg of intravenous methylprednisolone has been shown to provide some patients with relief in open-label studies, but this strategy has not been adequately studied to provide a more widespread recommendation for its use. Occasionally, an intravenous dose can be used before starting an oral regimen for transitional therapy. Intravenous DHE may be a reasonable therapy for some patients. It has been studied when administered over an inpatient admission with repetitive infusions. All patients studied were headache free by the fifth admission day, 90% by the 3rd day and many patients remained headache free in the 3 months that followed although this was more robust in the episodic CH group compared with chronic CH. Injection therapies may be an excellent resource for some refractory patients, but they require resources such as an ambulatory infusion center, or in the case of DHE, may require admission to hospital. As such, these strategies may not be readily available to all patients and place a larger burden on health-care resources. Suboccipital steroid injections are currently the only preventive strategy to have a Level A recommendation from the AHS guidelines, although it is primarily used as a transition strategy. One randomized, double-blinded, placebo-controlled study of 43 CH patients demonstrated a robust effect. There was a reduction of daily attacks in 20 of 21 patients compared with 12 of 22 controls (odds ratio 15.4, 95% confidence interval [CI] 1.8–116.9, P = 0.012). The effect of these injections appears to be temporary. At 15- and 30-day posttreatment, the treatment and placebo groups did not differ in a study by Leroux et al. A recent observational study revealed that triamcinolone and bupivacaine injections lead to a longer pain-free period in episodic compared with chronic CH patients. In clinical practice, the steroid component and injection pattern may differ somewhat among practitioners and further research is required to determine which ingredient is superior and whether the combination of a steroid and local anesthetic is superior to either in isolation. It is typical to introduce a maintenance prophylactic treatment simultaneous with the suboccipital steroid injection. These injections are typically well tolerated and safe with minimal adverse effects but do require a visit to a provider who can perform the procedure. Preventive treatment refers to the recurrent use of a treatment strategy designed to reduce the frequency and/or suppress the attacks during the duration of the patient's typical cluster period with the goal of reducing the frequency and severity of cluster attacks. Most treatments that are available for the preventive treatment of CH are oral medications. Despite routine clinical use of many of these treatments, the evidence for their use is modest. Invasive or surgical approaches exist, but these should be a measure reserved for only the most refractory patients. The most commonly used oral agent for the preventive treatment of CH Is Verapamil. The dose range used for verapamil is wide and ranges from 240 to 960 mg/day (in divided doses), although most patients will respond at doses lower than 480 mg daily. No high-quality studies have been carried out, but even a small dose of 360 mg has been found to be superior compared with placebo in a double-blind placebo-controlled study of 30 CH patients. By week two of the trial, both the attack frequency and abortive medications used were lower in the verapamil group compared with placebo (P < 0.001 and P < 0.004, respectively). Verapamil has a Level C recommendation from the AHS guidelines  but a Level A recommendation from the European Federation of Neurological Societies (EFNS) guidelines. Patients using verapamil should be counselled regarding its side effect such as constipation, peripheral edema, and hypotension. Because of a risk of heart block, a baseline electrocardiogram should be obtained before beginning treatment and should be repeated 2–4 weeks after each dosage increase. Lithium has a Level C recommendation from the AHS  and a Level B from the EFNS. Several open-label studies have shown efficacy , and a comparison with verapamil showed similar results between the two agents. The target dose is typically 600–1500 mg daily. Common side effects include tremor, diarrhea, and polyuria. As it has a rather narrow therapeutic range, serum levels may need to be monitored. Lithium is generally considered a second-line agent. Melatonin (Level C recommendation from the AHS  and EFNS) at a dose of 10 mg may be effective in patients with episodic CH, but is less effective in chronic CH. Melatonin is a safe and well-tolerated treatment option. Clinical experience suggests that some patients may respond to elevated dosages of melatonin (20 mg). At higher doses, there may be issues with paradoxical insomnia or nightmares. Melatonin can also be used safely in concert with other preventive measures. Other oral treatments have been studied in a limited capacity or are not currently rated by the AHS or EFNS guidelines, but could be considered in patients when approved methods fail. These include topiramate (100–200 mg), gabapentin (900–3600 mg) and baclofen (30–60 mg)., Although methysergide was used widely by specialists and known to be effective for the preventive treatment of cluster headache , it is no longer manufactured and available for use. Agents with negative studies and therefore not recommended include valproic acid, daily sumatriptan, cimetidine, misoprostol, and candesartan. Civamide intranasal has been evaluated for the preventive treatment of episodic CH. It is administered in each nostril at 100 μL of 0.025%. Unfortunately, it is not widely available and therefore not routinely used in clinical practice. As mentioned above, suboccipital steroid injections are the only preventive measure given a Level A recommendation by the AHS guidelines. This strategy, however, is typically used for transitional prophylaxis rather than long-term prophylaxis. However, some patients benefit from a long-duration response. Noninvasive vagus nerve stimulation (nVNS) has recently been studied in the CH population. A multicenter randomized controlled trial (PREVA) comparing a hand-held patient administered nVNS device plus standard of care (SOC) to SOC alone for the preventive treatment of chronic CH randomized 93 patients to three 90 s stimulations twice daily for preventive treatment. A reduction in cluster attacks in the nVNS group (average 5.9 fewer attacks per week, from an average of 16.8 attacks per week over 4 weeks before enrollment) was greater than that seen in the control group (average 2.1 fewer attacks per week, from an average of 8.5 attacks per week) (P = 0.02 95% CI 0.5, 7.2,). The responder rate (>50% reduction in attack frequency) was higher in the nVNS group compared to the control group (40.0% vs. 8.3%), and participants in the active treatment group reduced their use of acute CH treatments. In two subsequent double-blind sham-controlled studies (ACTI; ACTII NCT01792817) that included both episodic and chronic CH participants, the primary endpoint was not met, but nVNS showed efficacy in a subgroup analysis for acute treatment of episodic by not chronic CH in both studies., Based on the results of these two studies, nVNS was approved by the US FDA for the acute treatment of episodic CH. Occipital nerve stimulation has been proposed as a possible treatment for refractory CH. It has been studied mainly in open-label or cohort studied but does seem to be a promising option for some patients. A recent study in 2017 reported a 50% response rate in 52.9% of patients. The use of triptans in responders dropped by 62.56%. A recent review of long-term follow-up of 30 drug-resistant chronic CH with a median follow-up time of 6.1 years showed promising results. The mean number of daily attacks dropped from 5.7 to 2.4 (P < 0.001). In addition, the effect in the responders appears to be sustained. Of the ten nonresponders, 5 had been responders, one for as long as 4 years before losing its efficacy. The most common adverse events were lead migration and battery failure, but adverse effects were common, occurring in 23 out of 30 patients. Overall, occipital nerve stimulation may be a viable option with some enduring efficacy for patients with drug-resistant CH. Like any invasive procedure, it is usually reserved for patients who are refractory to conventional therapies. Hypothalamic deep brain stimulation (DBS) has also been studied in refractory CH patients. Previous reports have shown promising results and have suggested that some patients may benefit from unilateral hypothalamic DBS; however, a more recent crossover sham-controlled crossover study did not reveal a clear benefit. There has also been serious morbidity, including intracranial hemorrhage, associated with the procedure and given its conflicting results in trials, it is not widely recommended. There may be a subset who benefit from DBS, but factors that predict response have not yet been established. Monoclonal antibodies that target the CGRP ligand, which have been effective for the prevention of episodic and chronic migraine, are currently being studied in episodic and chronic CH. Fremanezumab is being studies in episodic CH (NCT02945046) and chronic CH (NCT02964338) and Galcanezumab is also being studied in episodic and chronic CH (NCT02397473 and NCT02438826, respectively). Preliminary results from these trials are expected to become available in 2018–2019. CH is a debilitating headache disorder that relies on prompt diagnosis and treatment to reduce disability. There are multiple treatments options available for abortive, transitional, and preventive treatments which are summarized in [Table 1]. All patients with CH should have a proper abortive treatment strategy. Many patients require preventive therapy; particularly those with chronic CH. Patient with both episodic and chronic CH may require transitional therapy. Many patients will require abortive, transitional, and preventive treatment, sometimes simultaneously. Refractory patients may sometimes be treated with therapies that are still emerging or have been insufficiently studied. Well-established first-line therapies should always be used first before escalating therapy. Dr Dodick has received compensation from serving on advisory boards and/or consulting within the past 5 years for: Allergan, Amgen, Alder, Arteaus, Pfizer, Colucid, Merck, NuPathe, Eli Lilly and Company, Autonomic Technologies, Ethicon J&J, Ipsen, Zogenix, Supernus, Labrys, Boston Scientific, Medtronic, St Jude, Bristol-Myers Squibb, Lundbeck, Impax, MAP, Electrocore, Tonix, Novartis, Teva, Alcobra, Zosano, Insys, GBS/Nocira, Acorda, eNeura, Charleston Laboratories, Gore, Biohaven, Bioventric, Magellan, Theranica, Xenon, Dr Reddy's/Promius Pharma. Dr Dodick owns equity in Epien, GBS/Nocira, Second Opinion, Healint, and Theranica. Dr Dodick has received funding for travel, speaking, editorial activities, or royalty payments from IntraMed, SAGE Publishing, Sun Pharma, Allergan, Oxford University Press, American Academy of Neurology, American Headache Society, West Virginia University Foundation, Canadian Headache Society, Healthlogix, Universal Meeting Management, WebMD, UptoDate, Medscape, Oregon Health Science Center, Albert Einstein University, University of Toronto, Starr Clinical, Decision Resources, Synergy, MedNet LLC, Peer View Institute for Medical Education, Medicom, Chameleon Communications, Academy for Continued Healthcare Learning, Haymarket Medical Education, Global Scientific Communications, HealthLogix, Miller Medical, MeetingLogiX, Wiley Blackwell. Dr Dodick, through his employer, has consulting use agreements with NeuroAssessment Systems and Myndshft. He holds board of director positions with King-Devick Technologies, and Epien Inc. He holds the following Patent 17189376.1-1466:vTitle: Botulinum Toxin Dosage Regimen for Chronic Migraine Prophylaxis (no compensation). Dr. William S. Kingston has no conflict of interest. Choong CK, Ford JH, Nyhuis AW, Joshi SG, Robinson RL, Aurora SK, et al. Clinical characteristics and treatment patterns among patients diagnosed with cluster headache in U.S. Healthcare Claims Data. Headache 2017;57:1359-74. Robbins MS, Starling AJ, Pringsheim TM, Becker WJ, Schwedt TJ. Treatment of cluster headache: The American Headache Society Evidence-Based Guidelines. Headache 2016;56:1093-106. Bahra A, Gawel MJ, Hardebo JE, Millson D, Breen SA, Goadsby PJ, et al. Oral zolmitriptan is effective in the acute treatment of cluster headache. Headache 2000;54:1832-9. Fogan L. Treatment of cluster headache. A double-blind comparison of oxygen v air inhalation. Arch Neurol 1985;42:362-3. Cohen AS, Burns B, Goadsby PJ. High-flow oxygen for treatment of cluster headache: A randomized trial. JAMA 2009;302:2451-7. Kudrow L. Response of cluster headache attacks to oxygen inhalation. Headache 1981;21:1-4. Rozen TD. High oxygen flow rates for cluster headache. Neurology 2004;63:593. Rozen TD, Fishman RS. Demand valve oxygen: A promising new oxygen delivery system for the acute treatment of cluster headache. Pain Med 2013;14:455-9. Cittadini E, May A, Straube A, Evers S, Bussone G, Goadsby PJ, et al. Effectiveness of intranasal zolmitriptan in acute cluster headache: A randomized, placebo-controlled, double-blind crossover study. Arch Neurol 2006;63:1537-42. Rapoport AM, Mathew NT, Silberstein SD, Dodick D, Tepper SJ, Sheftell FD, et al. Zolmitriptan nasal spray in the acute treatment of cluster headache: A double-blind study. Neurology 2007;69:821-6.
van Vliet JA, Bahra A, Martin V, Ramadan N, Aurora SK, Mathew NT, et al. Intranasal sumatriptan in cluster headache: Randomized Placebo-Controlled Double-Blind study. Neurology 2003;60:630-3. Robbins L. Intranasal lidocaine for cluster headache. Headache 1995;35:83-4. Costa A, Pucci E, Antonaci F, Sances G, Granella F, Broich G, et al. The effect of intranasal cocaine and lidocaine on nitroglycerin-induced attacks in cluster headache. Cephalalgia 2000;20:85-91. Andersson PG, Jespersen LT. Dihydroergotamine nasal spray in the treatment of attacks of cluster headache. A double-blind trial versus placebo. Cephalalgia 1986;6:51-4. The Sumatriptan Cluster Headache Study Group. Treatment of acute cluster headache with sumatriptan. N Engl J Med 1991;325:322-6. Ekbom K, Monstad I, Prusinski A, Cole JA, Pilgrim AJ, Noronha D, et al. 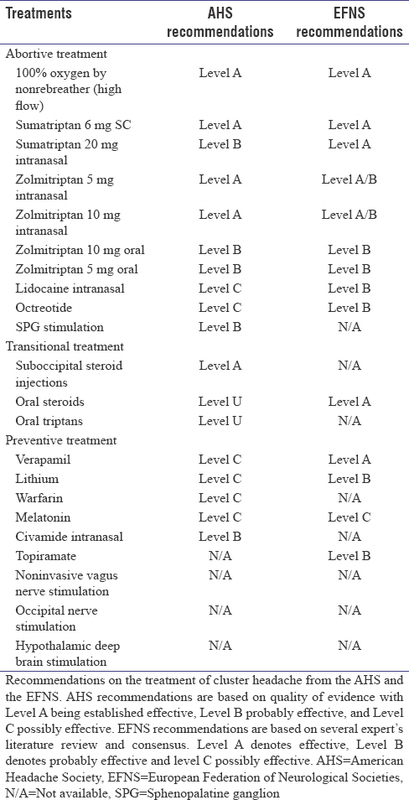 Subcutaneous sumatriptan in the acute treatment of cluster headache: A dose comparison study. The Sumatriptan Cluster Headache Study Group. Acta Neurol Scand 1993;88:63-9. Matharu MS, Levy MJ, Meeran K, Goadsby PJ. Subcutaneous octreotide in cluster headache: Randomized placebo-controlled double-blind crossover study. Ann Neurol 2004;56:488-94. Devoghel JC. Cluster headache and sphenopalatine block. Acta Anaesthesiol Belg 1981;32:101-7. Sanders M, Zuurmond WW. Efficacy of sphenopalatine ganglion blockade in 66 patients suffering from cluster headache: A 12- to 70-month follow-up evaluation. J Neurosurg 1997;87:876-80. Narouze S, Kapural L, Casanova J, Mekhail N. Sphenopalatine ganglion radiofrequency ablation for the management of chronic cluster headache. Headache 2009;49:571-7. Chua NH, Vissers KC, Wilder-Smith OH. Quantitative sensory testing may predict response to sphenopalatine ganglion pulsed radiofrequency treatment in cluster headaches: A case series. Pain Pract 2011;11:439-45. Fang L, Jingjing L, Ying S, Lan M, Tao W, Nan J, et al. Computerized tomography-guided sphenopalatine ganglion pulsed radiofrequency treatment in 16 patients with refractory cluster headaches: Twelve- to 30-month follow-up evaluations. Cephalalgia 2016;36:106-12. Bendersky DC, Hem SM, Yampolsky CG. Unsuccessful pulsed radiofrequency of the sphenopalatine ganglion in patients with chronic cluster headache and subsequent successful thermocoagulation. Pain Pract 2015;15:E40-5. Felisati G, Arnone F, Lozza P, Leone M, Curone M, Bussone G, et al. Sphenopalatine endoscopic ganglion block: A revision of a traditional technique for cluster headache. Laryngoscope 2006;116:1447-50. Pipolo C, Bussone G, Leone M, Lozza P, Felisati G. Sphenopalatine endoscopic ganglion block in cluster headache: A reevaluation of the procedure after 5 years. Neurol Sci 2010;31 Suppl 1:S197-9. Bratbak DF, Nordgård S, Stovner LJ, Linde M, Folvik M, Bugten V, et al. Pilot study of sphenopalatine injection of onabotulinumtoxinA for the treatment of intractable chronic cluster headache. Cephalalgia 2016;36:503-9. Schoenen J, Jensen RH, Lantéri-Minet M, Láinez MJ, Gaul C, Goodman AM, et al. Stimulation of the sphenopalatine ganglion (SPG) for cluster headache treatment. Pathway CH-1: A randomized, sham-controlled study. Cephalalgia 2013;33:816-30. Jürgens TP, Barloese M, May A, Láinez JM, Schoenen J, Gaul C, et al. Long-term effectiveness of sphenopalatine ganglion stimulation for cluster headache. Cephalalgia 2017;37:423-34. Couch JR Jr., Ziegler DK. Prednisone therapy for cluster headache. Headache 1978;18:219-21. Jammes JL. The treatment of cluster headaches with prednisone. Dis Nerv Syst 1975;36:375-6. Ito Y, Mitsufuji T, Asano Y, Shimazu T, Kato Y, Tanahashi N, et al. Naratriptan in the prophylactic treatment of cluster headache. Intern Med 2017;56:2579-82. Pageler L, Katsarava Z, Lampl C, Straube A, Evers S, Diener HC, et al. Frovatriptan for prophylactic treatment of cluster headache: Lessons for future trial design. Headache 2011;51:129-34. Monstad I, Krabbe A, Micieli G, Prusinski A, Cole J, Pilgrim A, et al. Preemptive oral treatment with sumatriptan during a cluster period. Headache 1995;35:607-13. Antonaci F, Costa A, Candeloro E, Sjaastad O, Nappi G. Single high-dose steroid treatment in episodic cluster headache. Cephalalgia 2005;25:290-5. Mather PJ, Silberstein SD, Schulman EA, Hopkins MM. The treatment of cluster headache with repetitive intravenous dihydroergotamine. Headache 1991;31:525-32. Leroux E, Valade D, Taifas I, Vicaut E, Chagnon M, Roos C, et al. Suboccipital steroid injections for transitional treatment of patients with more than two cluster headache attacks per day: A randomised, double-blind, placebo-controlled trial. Lancet Neurol 2011;10:891-7. Gaul C, Roguski J, Dresler T, Abbas H, Totzeck A, Görlinger K, et al. Efficacy and safety of a single occipital nerve blockade in episodic and chronic cluster headache: A prospective observational study. Cephalalgia 2017;37:873-80. Leone M, D'Amico D, Frediani F, Moschiano F, Grazzi L, Attanasio A, et al. Verapamil in the prophylaxis of episodic cluster headache: A double-blind study versus placebo. Neurology 2000;54:1382-5. Ekbom K. Lithium for cluster headache: Review of the literature and preliminary results of long-term treatment. Headache 1981;21:132-9. Bussone G, Leone M, Peccarisi C, Micieli G, Granella F, Magri M, et al. Double blind comparison of lithium and verapamil in cluster headache prophylaxis. Headache 1990;30:411-7. MacGregor EA, Evers S; International Headache Society. The role of methysergide in migraine and cluster headache treatment worldwide – A survey in members of the international headache society. Cephalalgia 2017;37:1106-8. Saper JR, Klapper J, Mathew NT, Rapoport A, Phillips SB, Bernstein JE, et al. Intranasal civamide for the treatment of episodic cluster headaches. Arch Neurol 2002;59:990-4. Gaul C, Diener HC, Silver N, Magis D, Reuter U, Andersson A, et al. Non-invasive vagus nerve stimulation for PREVention and acute treatment of chronic cluster headache (PREVA): A randomised controlled study. Cephalalgia 2016;36:534-46. Silberstein SD, Mechtler LL, Kudrow DB, Calhoun AH, McClure C, Saper JR, et al. Non-invasive vagus nerve stimulation for the ACute treatment of cluster headache: Findings from the randomized, double-blind, sham-controlled ACT1 study. Headache 2016;56:1317-32. Goadsby PJ, de Coo IF, Silver N, Tyagi A, Ahmed F, Gaul C, et al. Non-invasive vagus nerve stimulation for the acute treatment of episodic and chronic cluster headache: A randomized, double-blind, sham-controlled ACT2 study. Cephalalgia 2017. https://doi.org/10.1177/0333102417744362. [Last accessed 2018 Feb 24]. Miller S, Watkins L, Matharu M. Treatment of intractable chronic cluster headache by occipital nerve stimulation: A cohort of 51 patients. Eur J Neurol 2017;24:381-90. Leone M, Proietti Cecchini A, Messina G, Franzini A. Long-term occipital nerve stimulation for drug-resistant chronic cluster headache. Cephalalgia 2017;37:756-63. Leone M, Proietti Cecchini A, Franzini A, Broggi G, Cortelli P, Montagna P, et al. Lessons from 8 years' experience of hypothalamic stimulation in cluster headache. Cephalalgia 2008;28:787-97. Fontaine D, Lazorthes Y, Mertens P, Blond S, Ge´raud G, Fabre N, et al. Safety and efficacy of deep brain stimulation in refractory cluster headache: A randomized placebo-controlled double-blind trial followed by a 1-year open extension. J Headache Pain 2010;11:23-31. DOI 10.1007/s10194-009-0169-4.